Full truckload (FTL) solutions designed to meet the general commodity dry freight shipping needs of customers. 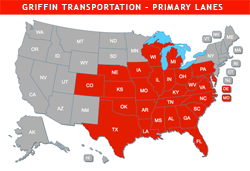 As an asset-based interstate carrier, Griffin dedicates its own transportation resources – including tractors, 53 foot dry van trailers, drivers and route schedulers – providing specific FTL freight shipping services to customers within contract carriage arrangements. Dedicated Truckload solutions are designed to meet customers’ shipping needs and optimize freight routing, scheduling and delivery service. If you are interested in learning more about the Griffin Advantage in quality transportation services, please contact us at (866) 609-3449.